Having a list of Debit Notes issued is not a problem. However, it is important for your company staff to be able to collect the remaining payment so the account is balanced out for auditing purposes. Thus, it is equally important to be able to sort and filter your Debit Note List accordingly for accurate results and take appropriate action. You can view the issued debit note in BMO Online Inventory Management System by following the steps as shown as below. 1. 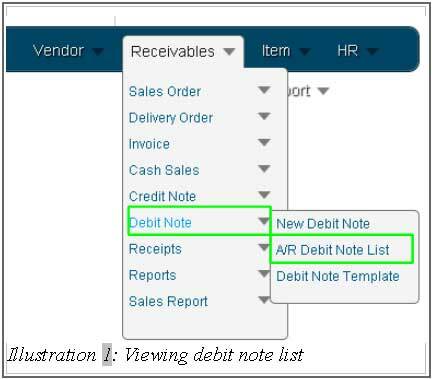 Click on the “A/R Debit Note List”(Receivables > Debit Note > A/R Debit Note List) on the navigation menu bar. 2. Fill in the “Debit Note Filter” by selecting “From Date” and “To Date”, or you cna click on the small calendar icon beside the text box to choose a date. Besides that, you can also fill in through “Customer” to search by customer. After that, click on “Search” to search the Debit note user wanted. Otherwise, click on “Reset” to reset the search/refreshing the page. 3. After clicking search in “Debit Note”, you will be able to see the list as shown in the image below. The “Debit notes” list has been filtered out. By default, if you go Debit Note page directly, the list will show all the debit notes. Click on “Debit Note Serial Number” as highlighted below and a printable screen with the Debit Note details for printing purpose. Alternate methods will require you to click on “View” and “View PDF”. You can also delete the credit note by clicking on “Del” and edit by click on “Edit”. On top of that, users will be able to view the “Summary” of the amount as Total Amount of DN, Total Amount, Total Paid Amount and Total Outstanding.